Merlin is a British fantasy-adventure television series developed by Julian Jones, Jake Michie, Julian Murphy and Johnny Capps. The series is based on the Arthurian legends of the mythical wizard Merlin and his relationship with Prince Arthur, but differs from traditional versions of the legend in many ways, especially the characters. After a successful first season, American broadcaster NBC began airing the programme on 21 June 2009, but after a decline in viewership, was moved to the cable network Syfy, where it began broadcast of the second season in April 2010. The second season began airing in September 2009 on BBC One. The concept for Merlin was influenced by the American show Smallville, about the early years of Superman. After many failed attempts to bring the programme to life, development of the current Merlin began in late 2006, with physical production beginning in March 2008. Merlin is a sorceror who arrives at the city of Camelot, after his mother arranges for him to stay with Gaius, the court physician. He discovers that the king, Uther Pendragon, has outlawed magic and has imprisoned the last great dragon deep under the city. The dragon informs Merlin that he has an important destiny to protect Uther's son, Arthur, who will bring forth a great Kingdom. When he meets Arthur for the first time he believes that he is arrogant and Arthur views Merlin as subservient, as Merlin has to keep his magic a secret or face execution at the hands of Uther. Morgana is Uther's ward and daughter with the power of prophetic foresight, which frightens her and which she keeps secret. Guinevere, whom she calls "Gwen", is her maid servant and close friend. 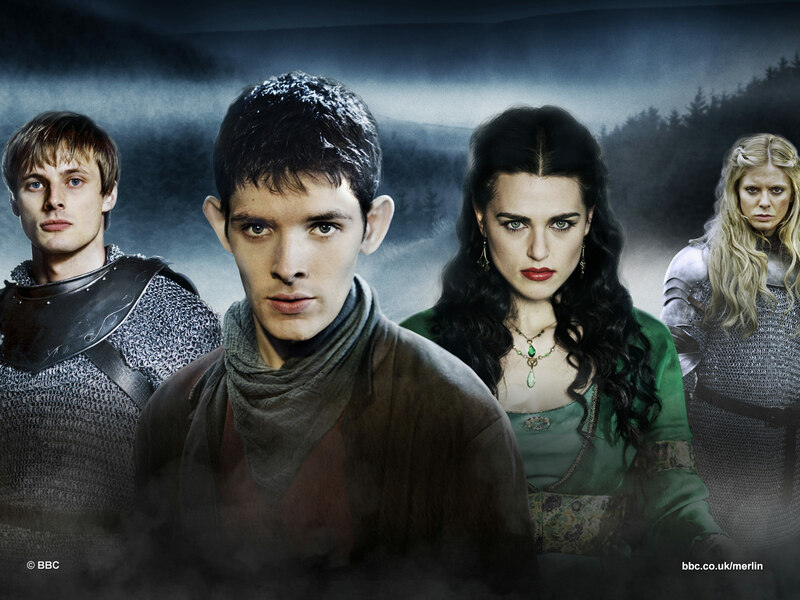 The first series focused on the development of Merlin and his friendship with Arthur. The second series focuses more on development of the other cast members. Some of the central themes of the series are the budding romance between Arthur and Gwen and Morgana's struggle to control her powers. Other characters from Arthurian legend have also appeared. Lancelot longed to become a knight but was unable to do so because of his birth as a commoner. Mordred has appeared as a Druid boy who formed a bond with Morgana (in legend he is her nephew), and it has been predicted by the dragon that Mordred will be the cause of death of Arthur (in the legend this occurred at the Battle of Camlann). Mordred and the Great Dragon refer to Merlin by his Druidic name, Emrys (the Welsh form of Ambrosius); Ambrosius Aurelianus was a historical figure that Geoffrey of Monmouth partially merged with Merlin. Excalibur is an ordinary sword that becomes enchanted by the Great Dragon and is later thrown into a lake (in the legends, this was the sword Nimueh gave to Arthur). Most kind LMS - thanks! I just clicked "End" since I don't think Season 3's available over here , but for starting the thread . Having successfully pulled off a second series that deepened its character’s relationships, the stage is set for Merlin to launch into a third series that pushes this fantasy to the next dramatic level. Unfortunately, a lot of the good work in “The Tears Of Uther Pendragon” was dragged down by the show’s adherence to a formula I’d hoped it had evolved beyond. Merlin feels trapped between two audiences: the young kids and families (who just want an hour of magic and monsters), and the older crowd (who value the strength of the Arthurian legend and relish the potential for an epic emotional drama). It can never quite decide where to pitch itself, so it often ends up attempting both and dividing reactions. You only have to look at the show's regular timeslot to figure out who it's pitched towards. First and foremost, it's Saturday evening family entertainment and there's very little chance of it ever fully catering to an adult crowd. Thus, my advice would be to enjoy it for what it is and judge it with a slight grain of salt. waiting for series 4! This show is fantastic! Perfect timing, what with Doctor Who coming to an end in a couple of weeks' time. I missed this show so much.